Let’s play lacrosse already! | Be The Best. When Chris played for Team BC in the Box National tournament in Ontario as a 14 year-old, we witnessed some amazing lacrosse. Of particular note was team Iroquois. They were small, but fast and they never ever gave up. I’ve written about them before but was reminded of them again this week when a video link was sent my way. Johnny Powless played at that tournment and was a lacrosse wonderkid. Sort of Gretzky-like. Amazing with the ball, without the ball and knowing where the play was going at all times. This video link shows Powless scoring a goal in the NLL a few weeks back. He’s just 18. I know beyond a shadow of a doubt that Chris is still watching this kid go. At the tournment back a few years ago, BC won the Bronze in an epic battle with Alberta. We all stayed to watch Iroquois Nation go against Ontario. Truly David vs Goliath. I’m literally getting goose bumps as I type this remembering the game. The Ontario team was HUGE. They have a massive population and they could have had 3 or 4 top teams and still been competitive. The Iroquois team was small. But they didn’t give up. I know they made a big impact on the BC boys watching. In many ways it was the early days of Be The Best. Yes, Iroquois did prevail to win the gold in one of the most fantastic lacrosse games I’ve ever seen. Here’s Johnny doing his thing today. 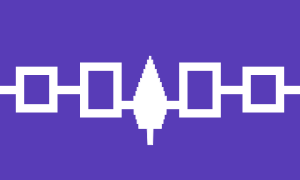 I’m wearing my purple Iroquois t-shirt with pride today and still have the hand- made wooden lacrosse sticks dangling from the rear view mirror of our car. Watch a little Be The Best in action…and this kid is only beginning.